Sometime in the eighth century, a nun sat at her writing desk in the scriptorium of the monastery at Chelles and cut a small strip of parchment measuring about 90 by 15/22 millimeters. In a script recognizable as a hallmark of her institution, she recorded, perhaps a little hastily, the words “rel sci gennouefe,” that is, “relics of Saint Genovefa” (Chartae Latinae Antiquiores, ed. Atsma et al., Vol. 18, No. 669: XL). She or one of her sisters took the piece of parchment and attached it to a small sack containing, presumably, a piece of the body of the saint, or perhaps some piece of matter associated with her or her miracles. Whatever the relic’s source—likely a wealthy patron—when the label was finished, a nun brought the relic to a small chassis and deposited the relic inside, where it sat undisturbed among many similarly encased and identified relics until the next relic that arrived at the monastery needed to be added. This eighth-century relic label for relics of Pope Marcellus comes from the large body of labels that survive from the Sens cathedral treasury. It features a decorated chrismon, or cross, at the beginning (not uncommon for a label), as well as a series of markings at the end that might be the scribe’s monogram or a note in a bureaucratic shorthand system called Tironian notes. Both of these features make it look like a tiny legal document. 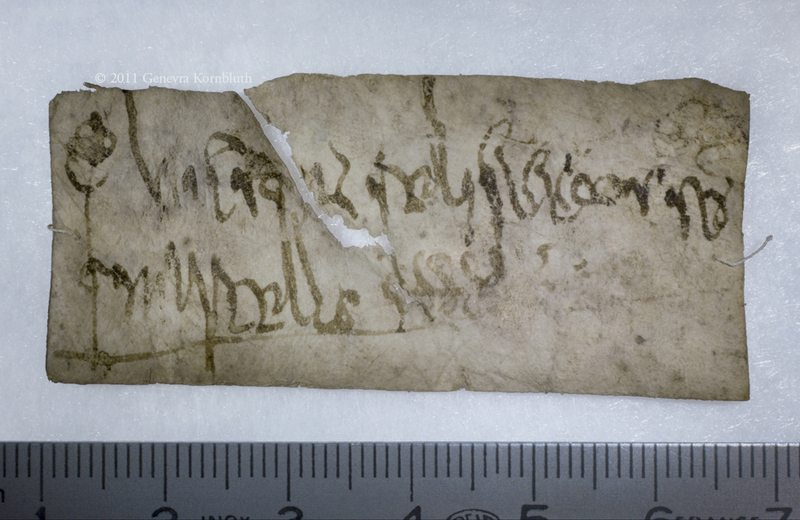 Early medieval relic labels are tiny objects with short texts—often frustratingly so, I find. As historical sources, however, they punch well above their weight in dispelling some of the obscurity of the worlds that produced them. Relics were closely connected with specific geographies, either because individual saints (like Genovefa) were venerated at and patrons of particular institutions in particular locales (such as Paris, which she was said to protect), or because those relics were associated with events that took place in specific places, such as the river Jordan in the Holy Land. As a result, labels reveal a lot about the geographic horizons of an institution like Chelles, as well as how those horizons changed over time. It is not too surprising to find evidence of a Parisian connection to Chelles, since only about twenty kilometers separated the two sites. But there are also some seventy further labels from the seventh and eighth centuries, allowing scholars to construct something of a network. The relics that were at Chelles earliest, copied in scripts that can be dated to c. 700, almost all come from saints in Gaul (examples include Martial of Limoges or Cassian of Autun), with single examples from Italy (Pope Martin) and the Holy Land (the Seven Sleepers of Ephesus). Relic labels in scripts datable to the eighth century or the second half of the seventh century suggest slightly wider horizons for Chelles, as more relics from Rome and the Holy Land appear, as do multiple relics from Egypt and Byzantium (Michael McCormick, Origins of the European Economy, 308-314). This is only one of the shifts visible in the labels from Chelles, but it is enough to provide a sense, otherwise quite dim, of where else and to what degree the female monastery of Chelles was connected with its outside world. In addition to situating a female monastery in an international network, relic labels also reveal something of the institutional culture of a female monastery. Part of this is the construction of a dramatis personae of the saints venerated by the nuns. Devotion to saints was a localized affair in Merovingian Gaul, based on the relics, patrons, and liturgical texts at a given institution. The list of saints is not a blandly generic comment on early medieval superstition, but a reflection of the religious life at Chelles specifically. In addition, these lists provide some sense of the annual rhythms of the liturgical year that regimented the lives of the women who lived at Chelles (Yitzhak Hen, Culture and Religion in Merovingian Gaul, 92-96). After Genovefa’s relics arrived at the nunnery, every year on January 3, those relics were placed on the altar, prayers to her were added to the mass, and a feast was held in her honor. The same was probably true for most or all of the saints whose relics were housed at the monastery, though the day on which the saint was venerated depended usually on the date on which the saint died, giving Chelles a fairly busy sanctoral cycle, honoring at least 48 saints. Finally, the need for labels suggests a set of complicated semiotic and theological issues that surrounded relics in the early Middle Ages. Another label at Chelles proclaimed the contents of its sack to be “de barba sancti bonifatii,” “from the beard of Saint Boniface” (ChLA Vol. 18, No.669:XXIII). This label distinguished the contents of its silk container as unique hair: holy hair from a holy individual, and thus separated from the general category of “hair” (Julia M.H. Smith, “Portable Christianity: Relics in the Medieval West (c.700-1200),” Proceedings of the British Academy 181 (2012): 143-167). It was not enough that the venerator of a relic know that the matter was in some way holy, however—Late Antique and medieval writers were clear that relics of uncertain status or uncertain identity should not be venerated (however imperfectly that dictate might have been followed). The label thus also did the important work of indicating that this holy hair came from the holy beard of St. Boniface, distinguishing it from the several other holy beards housed at Chelles in the eighth century. To lose knowledge about the identities of objects housed in a nunnery was a terrible tragedy for an institution whose reason for being centered, at least in part, on those objects. This was a risk that the humble relic label could help to address. Relic labels are useful for pulling back the curtain on the geographic and institutional worlds of Merovingian Gaul, but their production and use also offer a host of questions about the relationship between documentary practices, authenticity, and institutional knowledge-making. When the nun of Chelles wrote “rel sci gennouefe,” she was making an epistemological claim about the matter contained in that particular sack and an argument about the authenticity of the relic itself. Crafting a label established an institutional, intellectual, and social context for the relic. The labels themselves did not simply relate names, but gestured to stories about holy figures and sacred geographies, revealed the nuns’ engagement with the relic as a relic, and suggest a kind of bureaucratic processing of holy matter—not that there were official guidelines in eighth-century Francia—that gave the relic a confirmed home in the institutional church. Jake Purcell is a Ph.D. student in Columbia University’s history department studying the institutional and legal history of early medieval Europe. He is interested in documents, legal or otherwise, and the institutions that produced them in Merovingian and Carolingian Francia. Your article is certainly interesting! It would have been wonderful if you could show us an image of the actual piece of parchment from Chelles. No doubt you are aware of the study by Jean-Pierre Laponte, ‘Le trésor des saints de Chelles” (Chelles 1988), and you will be interested in the essay of Jane Schulenburg ‘Female religious as collectors of relics: Finding Sacrality and Power in the Ordinary” in the volume “When Heaven and Earth Meet: Essays on medieval Europe in honor of Daniel F. Callahan”, Michael Frassetto et alii (eds.) (Leiden 2014) 152-177. I am intrigued by your remarks about the institutional church in the eight century and its attitude to relics and veneration of saints. Is there really an unified attitude at all? Did the Carolingians achieve this or it this not the case at all, because nobody could actually control these matters? Thanks for your comments, Otto! I’ll see if I can find a usable image of the Chelles labels, which I agree would add something. I chose to use the Sens label because Genevra Kornbluth’s photos are such a fantastic resource for medievalists, and because that label gestures to the fact that the phenomena I describe above are true for different kinds of institutions (in the case of Sens, a cathedral) with different institutional goals and needs. For our other readers, Schulenburg’s study fits into a large and interesting body of scholarship on collecting and venerating relics and saints within female religious spaces, specifically (the literature on early medieval relics broadly has tended to thoroughly incorporate to issues of gender). The gendering bent to the historiography provides, I think, at least a partial answer to your (very big!) question about whether or not there was a unified attitude. Relic veneration and, by extension, relic labeling, had different meanings in different contexts, depending not only on gender, but also based on institutional function – was it a royal monastery, for example? – or the relationship between institution and saint – was the saint a patron? The McCormick passage I highlighted above also suggests that labeling happened in different ways at different places. He identifies programs of label copying at Sens but not Chelles, and some institutions used labels that came with relics, while others did not. So, there were differences, but they were not necessarily the result of political fragmentation or wildly divergent cultural spheres after periods of geographic isolation. Whether or not conformity of practice across institutions was either desirable or achieved under the Carolingians or earlier is something that I’ll have to look into. As a historian of the Merovingian who finds himself edging into Carolingian turf, I have to say that everything Carolingian, even Carolingian efforts at preserving plurality, looks a lot like centralization to me!